Easy Gourmet Recipes - Mangoes And Lychees With Mint Recipe. Healthy natural recipes including breakfast recipes, appetizer recipes, soup recipes, pasta recipes, holiday recipes, party recipes, dessert recipes, gluten-free recipes, raw recipes and budget recipes. Thanks to Alan Roettinger for sharing this decadent plant-based dessert recipe from his cookbook, Speed Vegan, published by Book Publishing Company. 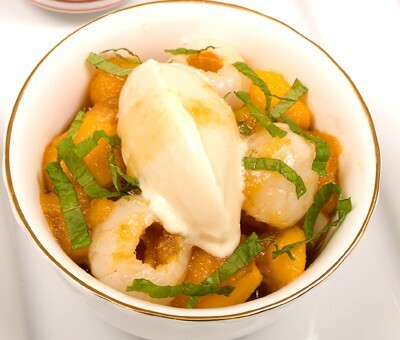 This mango lychee treat is delicious alone or topped with your favorite sorbet or vegan ice cream! 1. Peel the mangoes, and then cut them into cubes about 3/4 inch thick and put them in a bowl. Squeeze the juice from any pulp remaining on the pit into a separate small bowl and set aside. 2. Drain the lychees, reserving 1 tablespoon of the syrup. 3. Put the brown sugar and the tablespoon of lychee syrup in a heavy saucepan over high heat. Cook and stir for 2 - 3 minutes, until the sugar dissolves and the mixture caramelizes. Add the mangoes and stir gently a few seconds. Then add the lychees, reserved mango juice, lime juice, and ginger. Shake the pan as the mixture bubbles for about 1 minute. Remove from heat and let cool slightly. 4. Gather the mint leaves into 2 to 3 stacks. Slice them crosswise into 1/8-inch shreds. Fluff slightly to separate them. 5. Divide the mango mixture among 4 bowls. Scatter one-quarter of the mint leaves on top of each serving. Serve at once. Optional: top with your favorite sorbet!